It never ceases to surprise me how different I and M-the husband are.We just can't say, do or act similarly in any given situation. Sure, we are born and bought up in different countries, quiet different "kind" of families, different food but even as people we are different species. I understand opposite attracts and all that but you know the truth? You better find something in common. Its not really fun when the man works out like his life depended on it whereas I find every reason to skip a work out. It is not fun when I sleep like a horse, but the man wakes up at sharp 6.00 a.m. every single day. Its also not fun when we meet new people at the party and I end up talking so much and the better half just says a polite hello and then we get those strange looks, and I'm really not sure who those looks are for. Alright, ofcourse the strange looks are for me. But, one of the few common loves we share is for rice. If we had to share our last meal on earth, we are eating rice baby! That is, if we are not fighting over who's responsible for the situation. 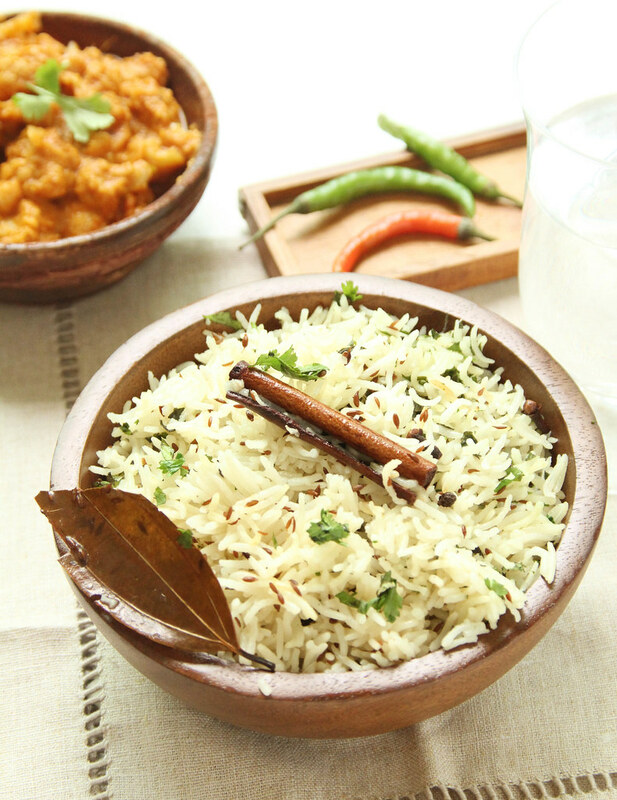 One of the most famous and simple Indian flavored rice is cumin rice called zeera chawal in hindi, where zeera means cumin and chawal refers to rice. 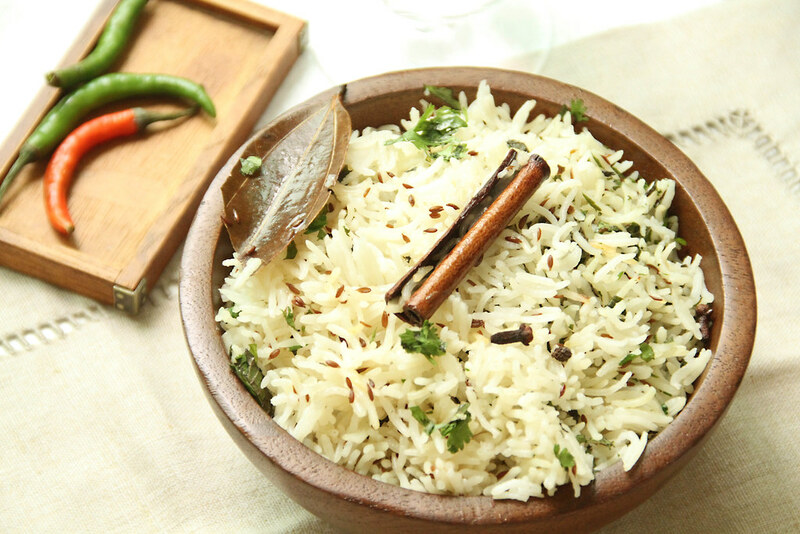 The fragrant long basmati rice studded with earthy cumin seeds are perfect pairing with curries and dal.Or just whip up a quick raita (yogurt based Indian salad) and pair it with chutney or pickle and you are ready to eat! I have added a few variations in brackets that you can use depending on what you have on hand. Here it goes. Wait! Question: If you and your partner had to share your last meal on earth, what are you eating? Wash and soak the rice atleast for an hour. 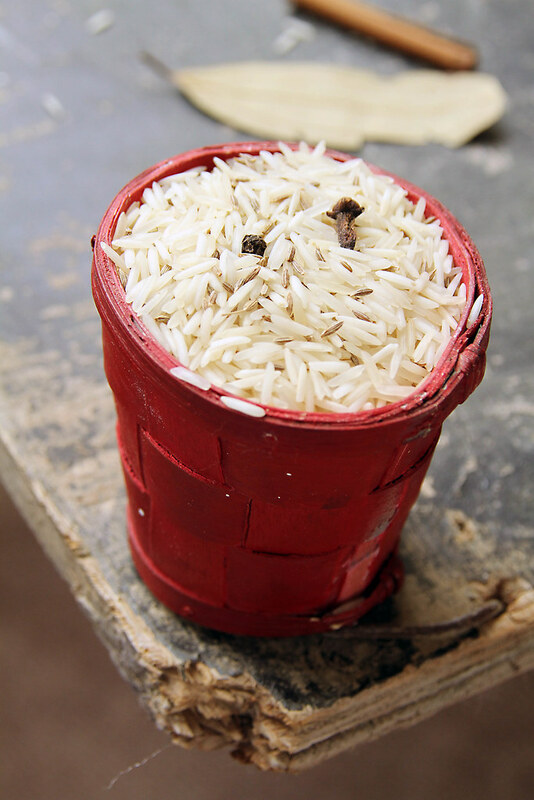 This helps the rice to be fluffy and less sticky. 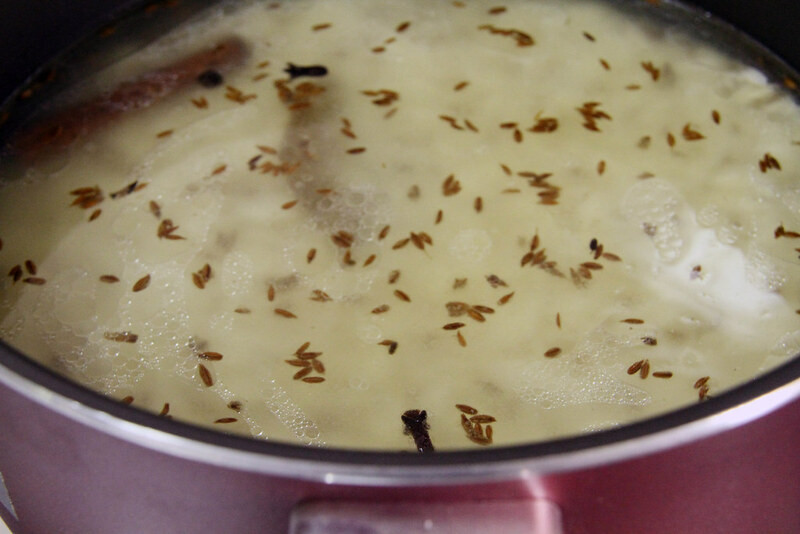 Heat ghee in deep and thick bottom saucepan (which has a lid). 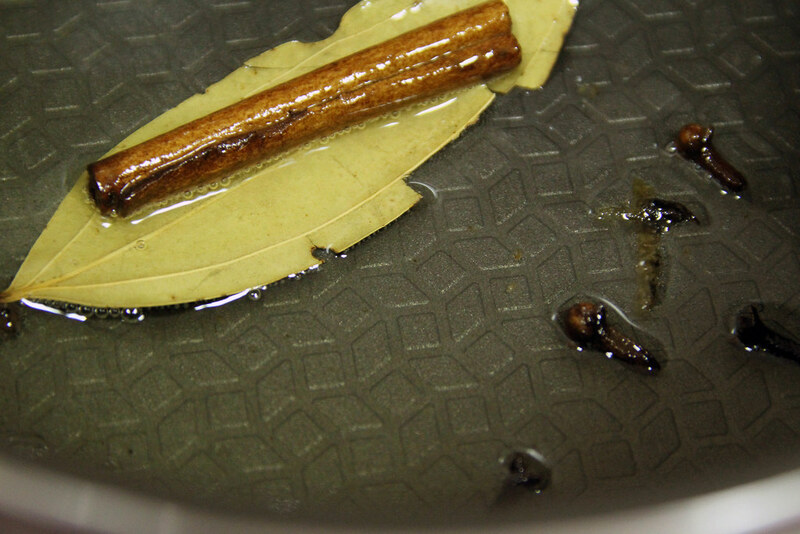 Add the bay leaf, cinnamon stick, cloves and peppercorns. Add the water and season with salt. Make sure the heat is turned on to high. 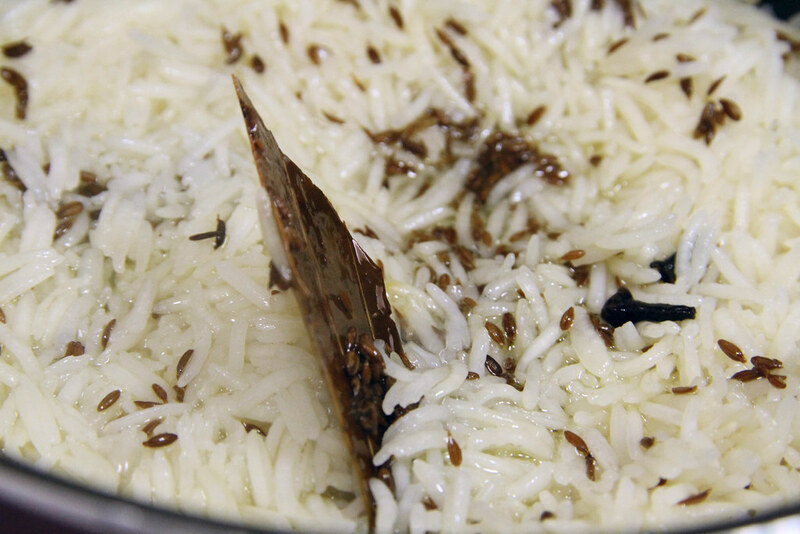 Try to minimize stirring or mixing with a spoon when cooking basmati rice as they can easily break. 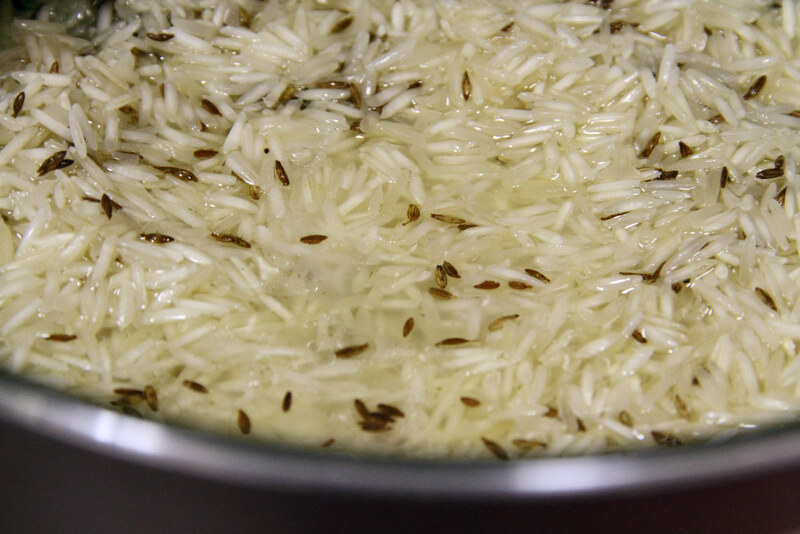 Once you see that the layer of water above the rice has evaporated (takes about 7-10 minutes), reduce the heat to medium, cover with a lid and cook for another 5-7 minutes or till the rice is done. Garnish with chopped mint, coriander leaves and fried onions. oh this sounds so delicious! simple yet with an aromatic flair! and i love your photo styling! I am with you on the opposite attracts thing - it is a mystery why and how my husband found each other! We share very little in common. But we do LOVE rice! As we should. And this looks divine!! What a cumin high Kulsum.I want that pretty red basket.Its effing cute. [Sorry for the word].Well I make some version of zeera rice everyday.Sometimes with peas, potatoes or plain.Isnt it addictive?I can eat it all on its own with lots of ghee and pickle. Well, I would still say that you are slightly lucky with M.I am not lucky even in the food department.The problem is that P dislikes even bengali food.Still figuring out his palate.One more thing..so there are more guys out there like P who get up at 6 a.m..I thought he was the only male "species" to do so. I love jeera rice...and the husband hates...I sound very much like you and the husband sounds very much liek yours :)The only thing we can agree on is sleeping late- now not possible with a 2 year old! My friend who's Indian loves to make this. It always sounds so delicious and yours looks fantastic! I'm in the same boat as you. The boy wakes up early, I stay up late. He can talk your ear off, I'm quiet. And he's from Kerala and I'm North Indian! And your rice looks incredible. Yum! The rice recipe is nice and easy to make. Your pictures and presentaion makes it exciting and heavenly! Congratulations on making it to FoodBuzz Top 9 recipes of the day. LOL, I don't think we would ever get to eat our last meal we would be too busy going back and forth trying to decide what we wanted! As I've mentioned we aren't the fastest decision makers when it comes to food, or anything else for that matter. I guess we would probably agree that it would be dessert though, we both have a huge sweet tooth. This dish look so beautiful! Your presentation is gorgeous, and it is tasty meal indeed!!! So many wonderful flavors! It looks wonderful! Sounds de-lish. Congrats on your top 9! This look mouth-watering...so delicious!I can almost smell the beautiful edgy flavors wafting across the room.Magic of Indian cooking,I guess! Do drop in sometime for a look around my place - have an event running as well.Would love to see you link up! This rice sounds so aromatic, very nice! I'm always looking for Indian recipes to try that don't require a whole long list of ingredients...this looks perfect. I always love the smell of basmati rice! Thanks so much for the recipe! I love flavoured rice. This is sensational! Bookmarked. Beautiful photographs. This sounds so fragrant and delicious. Gorgeous! I love the flavor combinations in this dish! 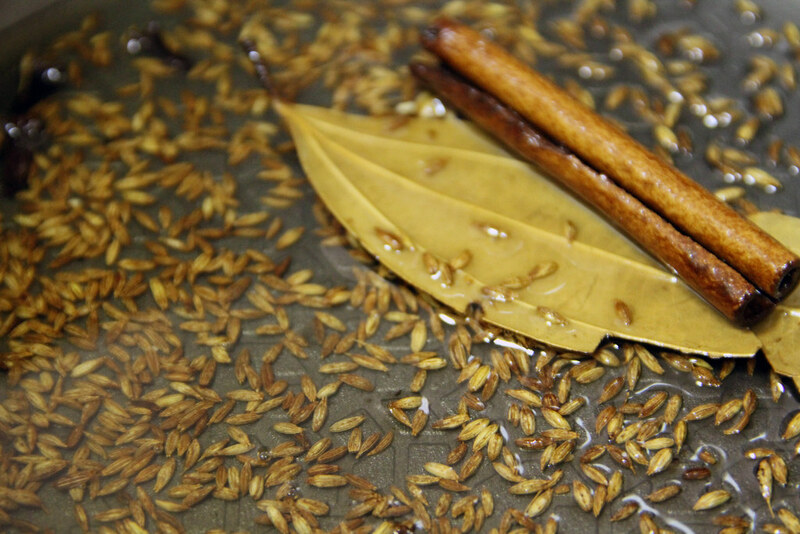 Cloves, cumin, cinnamon, bay leaf....this rice must taste like heaven. lovely picture...as usual..and cumin rice is a fav of ours as well and don even get me started on difference in opinions and habits between me and the other half..men i say! Cumin rice looks amazing. It will be soo good with Butter Chicken. Lovely! Always love fragrant rice like this! i always love cumin-scented dishes, so this is wonderful. Really enjoyed your photography. We love to go to Indian restaurant and I always wonder how the food is prepared. I love reading here and seeing exactly what goes into the dishes. A cinammon stick! Can't wait to read more. Amazing amazing pitures!!! Just can't stop staring at them. Mmmm cumin rice. This is making me seriously crave rice (and Indian food) for lunch! Lovely pics. I made this last night. It was wonderful! Thanks for a great recipe.